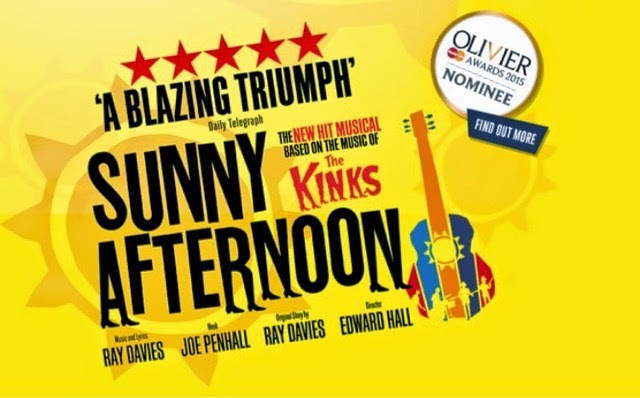 Set at the Harold Pinter Theatre tells the story of the hit band The Kinks. I was invited along to see the show with my mums office for this trip. First impressions of the theatre - the theatre itself is a couple minutes away from Piccadilly Circus Station. It's the road opposite Planet Hollywood for a point of reference if your not sure where to go. The theatre itself is fairly small but I honestly think this adds to the atmosphere of the show. I must admit at the time I did not know much about The Kinks but found I actually knew more of the music than I expected too. The stage set itself comes out into the audience so everyone has a chance to see what was going on. Downstairs in the stalls you had a choice of seats or tables with chairs for booking. Despite the theatre being small there is ample leg room for all during the show. The show itself was very well put together - the sets themselves are a massive bonus point for the show and well worth going to see. 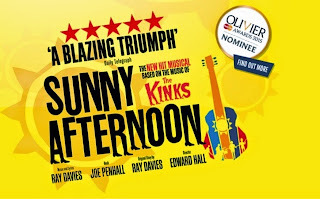 I thoroughly recommend this show to watch and promise you when you leave you will be singing the shows title song sunny afternoon for a while after. One thing to add after I was really impressed by all the staff. I had to track down and hope some lost property that went missing during the show had been lost at the theatre. The staff went to a lot of lengths to help me find it and after meeting the lovely guys at stage door to explain my plight I received a phone call a couple of days later to say they had tracked it down and it would be waiting for me to collect. If you get a chance to see the show definitely get some tickets booked up I guarantee you will enjoy it.